Still unsigned, Darqueze Dennard remains an option for the Bengals. But the franchise looks to have given the cornerback a price point. The Bengals have not closed the door on a reunion with the sixth-year cornerback, according to Paul Dehner Jr. of the Cincinnati Enquirer, but they have since signed B.W. Webb and retained some of their own free agents. The most recent negotiations between Dennard and the Bengals revealed a disconnect, with the team viewing him as strictly a slot cornerback — and one they may not consider paying at the top-market slot price Justin Coleman just reset with the Lions. Dennard’s camp came in with an offer north of what Coleman just signed, proposing a deal north of $10MM per year with the Bengals, Dehner reports, adding the corner’s representation never came back to the table with the Bengals. The team was willing to keep Dennard at around $8.5MM AAV, but that was before reaching a deal with Webb. The new Bengal corner played for first-year DC Lou Anarumo with the Giants. John Dorsey called Dave Gettleman on Monday to ask if Odell Beckham Jr. was indeed available. The Giants’ GM had twice said in 2019 he did not extend the wideout to trade him, but Gettleman told Dorsey he was, in fact, willing to move Beckham, Mary Kay Cabot of cleveland.com notes. Dorsey had several Beckham trades planned, but Cabot adds the talks never included Emmanuel Ogbah or Duke Johnson. Both of those pre-Dorsey Browns investments are now on the trade block. As for the player the Giants did obtain for Beckham, Jabrill Peppers profiled as one the Browns did not want to let go. Despite being a Sashi Brown-era draft choice, Dorsey wanted to keep the improving safety, per Cabot. But Cleveland’s second-year GM was not going to let Peppers stand in the way of acquiring Beckham. Gettleman was “adamant” about Peppers’ inclusion in this trade because of the Giants’ recent decision to let Landon Collins walk in free agency, Cabot adds. The Giants are planning a versatile role for the third-year safety. Peppers can be under Giants control through 2021 via the fifth-year option. The Steelers‘ acquisition of Mark Barron will likely not preclude them from using another early-round pick on a linebacker, according to the Pittsburgh Post-Gazette’s Gerry Dulac (on Twitter). Pittsburgh did not elect to devote significant resources to replacing Ryan Shazier last year but has used four first-round picks on linebackers since 2013 — Jarvis Jones, Shazier, Bud Dupree and T.J. Watt. Shazier’s unfortunate circumstances may again prompt the Steelers to use a first-round choice on an off-ball ‘backer. Eli Rogers‘ latest Steelers contract is for two years, not one, the team announced. The auxiliary receiver may have a bigger role in Pittsburgh’s 2019 offense, considering Antonio Brown is out of the picture and Rogers is entering an offseason healthy. He tore an ACL in the Steelers’ 2017 divisional-round game and only played in three games last season. The Steelers are keeping one of their own. 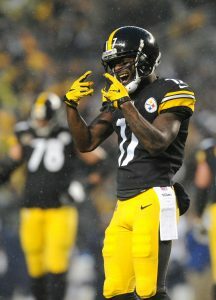 Pittsburgh is re-signing receiver Eli Rogers, a source told Mike Florio of ProFootballTalk.com (Twitter link). Per Florio, it’s a one-year deal for Rogers. It’s the latest move the Steelers are making to try and help replace Antonio Brown. The team also signed former Colts and Jaguars receiver Donte Moncrief to a two-year deal earlier. This news comes after the Steelers’ failed pursuit of Tyrell Williams. Rogers was an undrafted free agent in 2015, and missed his entire rookie season with an injury. He came out of nowhere and had a breakout season in 2016, catching 48 passes for 594 yards and three touchdowns in just 13 games. It was a promising debut, but he took a pretty big step backwards the next season when he had just 149 yards and 18 catches. Then in the playoffs, he suffered a torn ACL. The ACL took a long time to recover from, and Rogers didn’t end up making it back until Week 15 of last year. He did get pretty involved in the offense at the end of the year, catching seven passes for 57 yards in Week 17, which could be a good sign for him moving forward. The Steelers will have JuJu Smith-Schuster as their undisputed number one receiver next year, but after him the situation is up in the air. Rogers, Moncrief, and second-year player James Washington will all be competing for targets behind Smith-Schuster, and any one of them could break out. The Steelers may not have their starting running back on Sunday, but they will likely be equipped with improved wide receiver depth. Eli Rogers is in line to make his 2018 debut after the Steelers activated him Saturday, Adam Schefter of ESPN.com tweets. Rogers tore his ACL in last season’s divisional round and has resided on the reserve/PUP list all season. He returned to practice in late November. Pittsburgh’s primary slot receiver in 2016, Rogers was not used as frequently last year. The addition of JuJu Smith-Schuster and the return of Martavis Bryant relegated Rogers to part-time cog, and he recorded 18 receptions for 149 yards. In ’16, the former UDFA caught 48 passes for 594 yards and three TDs. Rogers’ role probably will not be extensive this season, either. Ryan Switzer and second-round rookie James Washington have functioned as Pittsburgh’s auxiliary wideouts. Neither, though, has been as productive as Rogers was two years ago. The Steelers non-tendered Rogers as an RFA in March, and the wideout rehabbed on his own. He visited the Chiefs, Raiders and Browns but wound up re-signing with the Steelers over the summer. Up by merely a half-game in the AFC North after a three-game losing streak, and likely to be without top running back James Conner against the Patriots, the Steelers can use all the help they can get in a big game Sunday. Following their Patriots clash, the Steelers have to travel to New Orleans, amplifying the stakes for their home game against the Pats. Steelers wide receiver Eli Rogers — who is currently on the reserve/physically unable to perform list — returned to practice today, according to veteran NFL reporter Howard Balzer (Twitter link). Rogers, 25, has certainly had an eventful 2018 to this point. After tearing his ACL in the divisional round of the playoffs, Rogers was non-tendered as a restricted free agent. He subsequently worked out for multiple teams — including the Chiefs, Browns, and Raiders — before re-signing with the Steelers in July. The NFL suspended Rogers for the first game of the season following a violation of the league’s substance abuse policy, but he was able to serve that ban while on PUP. Rogers has been a part-time player since entering the NFL in 2016, topping out at 62% playtime during his rookie campaign before dipping to 40% last season. The Steelers already have two top-tier wideouts in Antonio Brown and JuJu Smith-Schuster, so Rogers will have to compete with Ryan Switzer and James Washington for snaps. Because he’s already missed the NFL-mandated six weeks of action, Rogers can be activated at any time. If the Steelers don’t place him on their 53-man roster in the next three weeks, he’ll remain on the PUP list for the rest of the season. The NFL has suspended Steelers wide receiver Eli Rogers for the first game of the season after a violation of the substance abuse policy. In a statement, GM Kevin Colbert expressed his disappointment. The ban means that Rogers will not be able to take the field in the Sept. 9 season opener against the Browns. After that, he’ll be eligible to return for the team’s Week 2 contest against the Chiefs. Rogers was unlikely to participate in the first game of the season anyway, as he is still recovering from an ACL tear in his right knee. Odds are, Rogers will remain on the PUP list for at least the first six weeks of the season before getting an opportunity to play. Eli Rogers is back in Pittsburgh. The Steelers re-signed the wide receiver to a one-year deal on Monday, Adam Schefter of ESPN.com tweets. Rogers recently worked out for the Browns, Raiders, and Chiefs, but ultimately circled back to the Steelers with Wednesday’s deal. Rogers entered the league as a UDFA with the Steelers in 2015 and broke out in 2016 as he caught 48 passes for 593 yards and three scores in 13 games (eight starts). In 2017, however, Rogers slid down the depth chart following the selection of JuJu Smith-Schuster. Rogers had just 18 receptions for 149 yards last year, though he did chip in as a punt returner. The Steelers have at least four wide receiver spots locked down with Antonio Brown, Smith-Schuster, third-round pick James Washington, and Darrius Heyward-Bey under contract. Rogers will compete for one of the final WR spots with the likes of Justin Hunter, Trey Griffey, and others. When Eli Rogers tweeted Friday he had options for his 2018 season, it doesn’t look like the young slot receiver was exaggerating. In addition to a Chiefs workout, Rogers will audition for the Browns and Raiders, according to Pro Football Talk (on Twitter). The workouts will take place next week. The top slot option for the 2016 Steelers, Rogers saw his role reduced last season. His most memorable sequence came on a seminal Pittsburgh mistake, with a Ben Roethlisberger pass to a tightly covered Rogers resulting in a Patriots game-sealing interception that ended up paving a clear path for New England to secure the AFC’s No. 1 seed. In 2016, however, the former UDFA out of Louisville caught 48 passes for 594 yards and three touchdowns. Rogers tore an ACL in the Steelers’ divisional-round loss, but Adam Schefter of ESPN.com reported the 25-year-old pass-catcher’s made a surprisingly quick recovery. Seth Roberts still resides as the Raiders’ top slot option, despite delivering lower-end-to-middling production the past two years. Rogers would represent a challenge for that role and give the Raiders some additional depth behind Amari Cooper and Jordy Nelson in the process. Oakland now employs Rogers’ former Pittsburgh teammate, Martavis Bryant, as well. But Bryant may be destined for another suspension, and the ex-Steelers wideouts’ skills don’t exactly overlap, either. The Browns boast some fluidity among their receiving corps. Behind roster locks Jarvis Landry, Josh Gordon and Antonio Callaway are a few Sashi Brown-era draft picks — Corey Coleman, Rashard Higgins, Ricardo Louis — who are trying to impress a new regime. A Rogers addition would make matters more difficult for that to happen, especially for Higgins or Louis. After an injury-plagued first two seasons, Coleman’s been mentioned as a possible trade candidate.